Share what you thought about Fighter and earn reward points. Had I known I’d be up until 4am sobbing over this book I definitely would have waited until the morning. Instead, I read it all in one sitting and have such the book hangover now...Lucky and Dray. 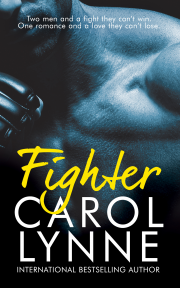 Oh my gosh...Author Carol Lynne has put such a gut wrench twist to his story that I would never have guessed, would have suspected, had me bawling. Her characters in this story from Lucky, to Brick, to Jax sucked me in, ripped my heart out and left me heartbroken. The ending is less than storybook perfect because, we are dealing with broken people, but yet is so beautiful. This book was well worth staying up all night to read and I would do it again in a heartbeat. First let me say I loved this book. It really captured my heart. This book is truly a angsty romance that will have you experiencing every range of emotion possible. This is a love story, but it reads like a labor of love for Ms. Lynne. The story is also a wonderful love story and a story about the connections we forge in life...This is about fighting the past to rise above it all to make a better future. I loved that the author introduced so many heart tugging elements into the story and weaved it all to create a story which truly touched my heart...Lucky and Dray will indeed make you fall in love with them and so will all the other characters. I just can’t wait to read the next book in the series. Highly Recommended. I loved Brick, and Flint, and Mac, and Jax...I loved how Dray fights for Lucky when he won’t fight for himself...I loved the connection between the two men. I loved the relationship between Brick and Lucky. And Brick and Dray. Everything about it was excellent. This was heartbreaking yet beautiful... Truly, this was an amazing read and I look forward to seeing where the series goes from here... I really liked it!